This is the Don Vardo by Portland Alternative Dwellings (PAD). The first Don Vardo was designed and built by Katy Anderson in 2010. Plans are now available for this micro home. Learn more about the Don Vardo Small House Plans. Photo above by Oregon Home Magazine. Photos below by PAD. This entry was posted in Plans and tagged dee williams, don vardo, house plans, Katy Anderson, pad, tumbleweed. I love the colors here, along with the fact that all sides have windows and there are no cabinets, closets, bathrooms, etc, blocking the view. Finding this plan and these photos has inspired me to try and figure a way to have bathroom facilities without walls, as weird as that sounds. Thanks for the inspiration, Dee! I’m having the same issue with my tiny house build re: unneccessary walls that obstruct the sight lines, particularly the bathroom. I thought about it and thought about it and was finally, “..Well, it will be mostly only ME using the toilet, so why would I want to build walls all around it? My solution I think will be a screen perhaps (and a willingness to go outside while someone else is using my facilities!). Why not, right? Just one of the aspects of TH living. I’m also seriously considering having ALL my storage be below waist height, even when it comes to hanging clothes. Thought I’d make use of storage in the front porch and build special storage boxes up in the loft space. Other than that…GET RID OF IT. I’m treating my TH like a travel RV that I’m going on a veeerrrrry long trip in; whatever I want to travel with comes with me, what I don’t I don’t keep! (I also wonder why more people don’t mention keeping a storage locker in the town that they live in. They’re ony 60 bucks or so a month and you could store everything you don’t use daily and everything you couldn’t dream of parting with. For such a small expense, wouldn’t it be worth it so as to have a COMPLETELY UNCLUTTERED tiny house?? Does anyone have an idea how much it costs to build one of these? It all depends how elaborate you want it to be. Right now I am collecting materials to build one. Pallets, I am able to find some of them free. I will use them for the flooring, cabinets and shelving. Cost, is the power I use to charge my power tools. There are lots of ways you can save $$$$. My budget is the very low thousands. I wish you good luck. Also how big do you want one will effect the cost. I doubt Jay will be upset because the vardo style existed before Jay was born. He has a proprietary design for a tiny house but his house look very different from this one. 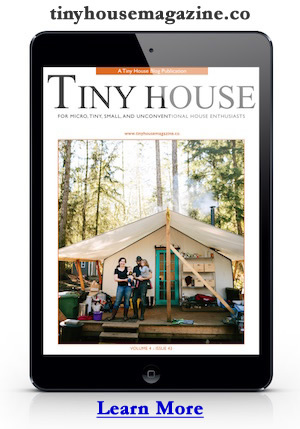 Hi, love these micro houses and trailers, I wondered how much something like this Don Vardo weighs? In the UK without a special ‘trailer licence’ you’re not allowed to tow much more than 750kg behind a car. I would suspect that all that lovely wood is quite heavy? Yes, I am wondering the same thing. How much does it weigh? Does the roofing material bend or is it rolled to match the curve of the roof? The particular roofing material pictured here was rolled to match the curve due to the raised ribs. Another type of metal roofing might make that curve, but probably best to have it rolled.